26.6 kilometres and 1680 metres (5500 feet) of ascent - this is a gigantic and beautiful ride well worth the visit. Time is running out this year for the high Alps climbs but the weather forecast was cool yet perfect. 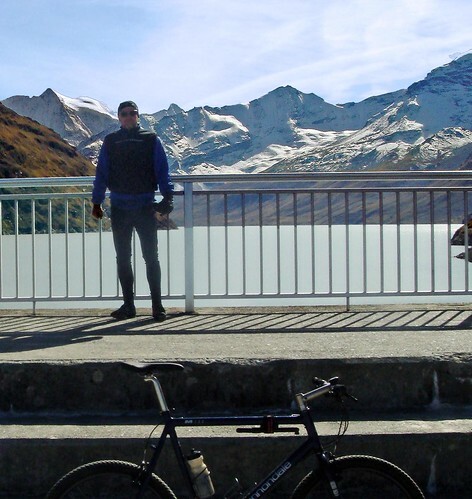 So Eric and I headed to Sion in the Valais region of Switzerland to climb up to the Barrage de la Grande Dixence. The route starts out climbing above Sion. A little bit of traffic but after passing a couple of villages it becomes very quiet. After a flattish bit in the middle of the route, the best and hardest part begins. With perhaps 9 or 10 kilometres to go, the huge dam comes into view high in the distance. It’s a daunting challenge. 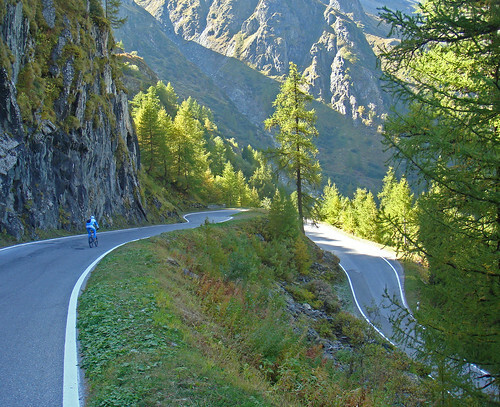 The last 5 kilometres wind up the end of the valley on superb and steep hairpins before the route ends at the bottom of the massive dam wall. A steep ramp hit me pretty hard and I stopped to enjoy the atmosphere, eat a little, and mentally prepare myself for this last stretch. At the end of the road, we of course wanted to see the lake. I had a road bike and thus needed to take a cable car up to the top. Meanwhile Eric (being Eric) took his mountain bike up a very steep but rideable little gravel road and we met up top on the dam itself – a very cold but beautiful 2365 metres. It’s a huge lake – with high snow covered Alps at the far end. Unlike Lac d’Emesson, the water is more gray than blue giving a more remote feel. There is a lots of hiking up top and also a trail on the right side that appears rideable for a long way along side the lake. Maybe we’ll try exploring next year. Ooops, I left my GPS on when I took the Cable car …. 220 of the easiest metres this year! Ouf ! 26 km et surtout 1680m de dénivelé c’est pas de la rigolade ! 6,3% de pente moyenne (j’ai sorti ma calculette 🙂 ) Mais la moyenne est cassée par le replat de 3 kilomètres et le premier kilomètre. Found your excellent write up on a Google search and gave the Dixence a stab this morning. A beautiful climb and tough last 7km. Not many other cyclists about and I got a round of applause as I cycled slowly up the last stretch through the car park. Great website Will. 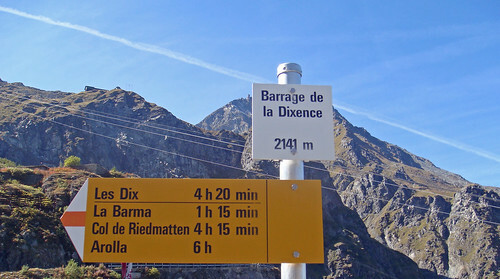 A little update/question as regards the road to the Grande Dixence dam. I went there by car in last June (taking advantage of a “bad weather day” that forced me to switch to “recognition mode”) O:-) and I noticed there was a sign forbidding bicycles at the gate of the last (gravel) stretch (actually, the access was also supposedly forbidden to pedestrians, but they still have the regular hiking path to the dam). 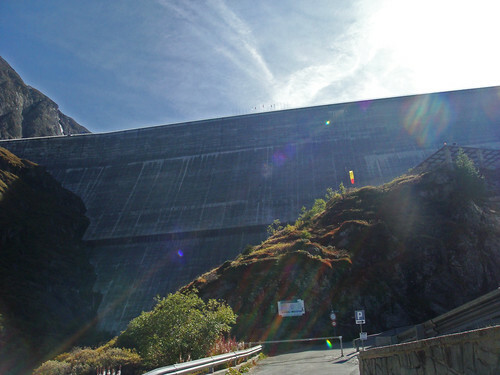 When I asked about it at the little museum (about the dam), they told me it was not possible to cycle there because it was dangerous due to some potential rock slide. That’s too bad because it would be really fun to be able to bike until the top… and beyond (for those who enjoy tunnels like you) 😛 as it seems you could reach even the end of the lake and enjoy more spectacular views!